Learn how to make soy milk so with a little extra work you will enjoy cheaper and far more delicious soy milk, compared to what is on offer in the shops. It’s very important to immediately clean whatever utensils that touched hot soy milk. When possible, grind the beans as fine as possible, so you don’t need a sieve: once you forget to clean a sieve that’s dirty with soy, it’s very hard to get it clean again. Nothing beats making the milk at home: for starters it will be much cheaper, not as diluted, not containing added sugar nor additives, compared with what you would buy in the supermarket. Even when buying organic soy beans, you will end up cheaper than buying normal soy milk in the supermarket. When you drink soy milk every day, then buy a sieveless soy milk maker (these models have a very good blender mixing the beans very fine, so no need to sieve afterwards) like in the picture on the right: you can also use it to make almond milk, rice milk and … boil soup! 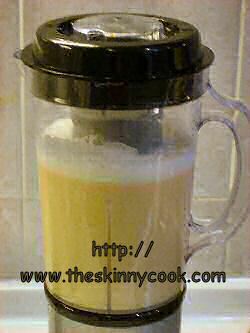 Use about half a cup of dry organic soy beans to make about 2 pints of soy milk (that is 15 grams of soy beans for about 1 liter of soy milk). Soak half a cup of soy beans for at least 5 hours in water: when you don’t want to much of the beany taste, soak your beans overnight in the fridge. Mix or blend the beans with 2 pints/1 liter of water. Sieve the mixture and poor in a high pot. Heat the milk in the pot until it boils. Soy milk foams excessively when boiling! Boil for 5 or 10 minutes so you can store the milk up to a few days in the fridge. Unsweetened soy milk tastes better when you add some salt! Otherwise just sweeten it with a bit of palmsugar.